Early each weekday morning, about 550 construction workers arrive on site to work on USC Village, the biggest development in South L.A. history. Soon, many of them will move on to construction jobs elsewhere and a new group will arrive as work takes a turn toward completion for the $700 million residential and retail complex. Rough carpentry, including walls, floors and roofs, along with extensive wiring and plumbing, is wrapping up fast. Journeymen and apprentice builders are beginning to arrive on site for finish carpentry. Doors will be hung, sinks will be installed and closets will be put together for about 2,700 USC students who will move in next fall. 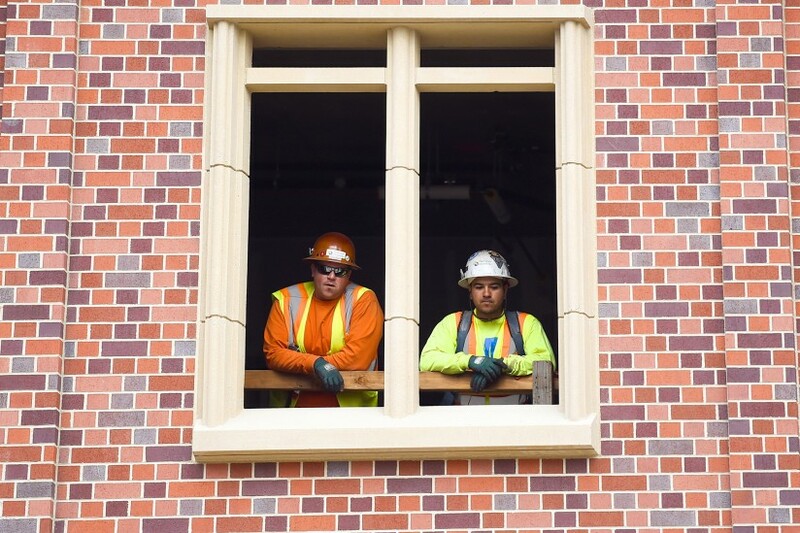 “We’re about five months away from finishing the buildings as far as the city’s concerned,” said Willy Marsh, director of construction at USC Village. Marsh is always looking ahead, but when he pauses to glance back, he sees endless hours of preparation and impressive numbers. 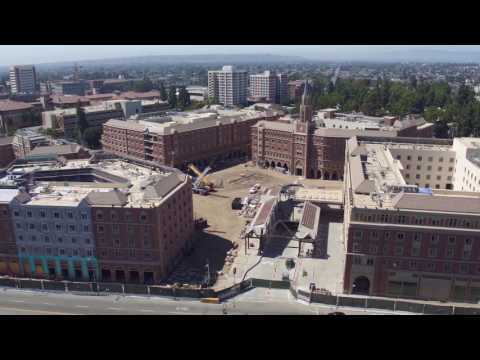 USC Village is beyond 75 percent complete. The development has provided 1.7 million man hours of work and employed more than 4,800 people. 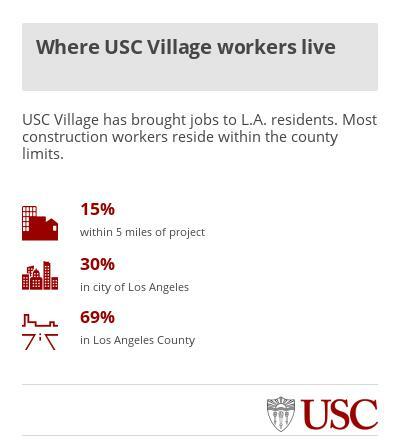 Fifteen percent of USC Village workers live within five miles of the project, while 30 percent live in the city of Los Angeles. The majority, 69 percent, live in Los Angeles County. 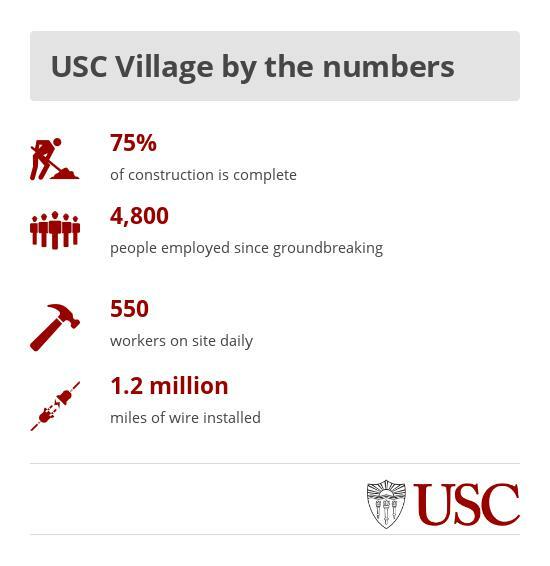 The number of serious injuries among USC Village construction workers has been less than 0.01 percent of the total work force. Equally impressive are numbers related to materials: 110,000 cubic yards of concrete have been poured, 23 million pounds of rebar were used and 1.2 million miles of wire have been installed. 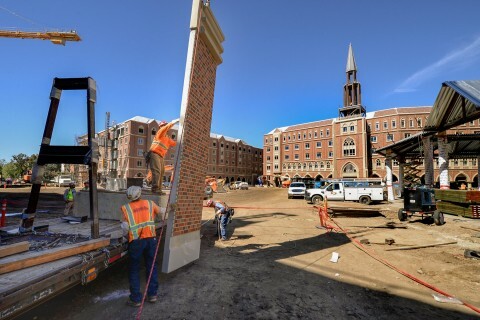 Between 7 a.m. and 3 p.m., the USC Village site looks like a construction time-lapse video. Everything moves quickly — mature trees weighing in at 3,500 pounds swoop in and are lowered into place by crane operators. As many as 80 trees have been planted, with 140 more on the way. “It’s a very fast pace. Things go up before you turn around,” said Eric Williams, an International Brotherhood of Electrical Workers electrician and nearby resident who’s worked for Morrow-Meadows, a subcontractor at USC Village throughout this year. “I walk in, work for a while, and I can’t go back out the way I came in because somebody’s put up a wall while I’ve been working. USC Village covers 15 acres, comprises 1.2 million square feet of mixed-use space and represents the biggest expansion ever of the University Park Campus. USC President C. L. Max Nikias has called the development an “architectural masterpiece” that will allow USC to become a fully residential university. As for the USC Village experience, “it’s going to walk, talk and feel and like you’re on campus,” Marsh said. 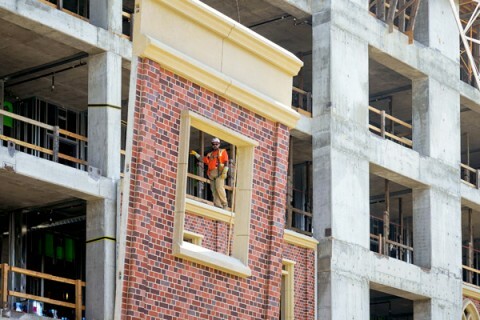 USC Village will include eight residential colleges housed in six buildings. More than 100,000 square feet of retail space on the ground floors will be occupied by Target, Trader Joe’s, Starbucks and Bank of America. Also set to open in fall 2017 are food and beverage outlets, including Sunlife Organics, Cava Grill and the Greenleaf Gourmet Chop Shop along with a 30,000-square-foot fitness center. USC Village will host a transit hub, offer 466 parking spaces for retail customers and provide covered parking for 1,500 bikes near building entrances. Retailers will provide their own tenant improvements, taking an empty shell and transforming it into their own signature space. “They make it look and feel the way they want, and customize it,” said Marsh, who’s overseen every inch of USC Village since the planning stages five years ago. The $700 million residential and retail complex will change the way Trojans live and learn when it opens in fall 2017. 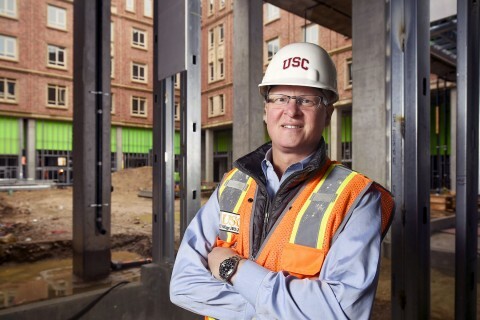 Meet the USC alum keeping the $700 million residential-retail project on time and on budget. Workers oversee the installation of enormous brick panels at the busy construction site, where buildings are starting to take shape.